One of the greatest things about technology is that it has enabled us to do just about everything more quickly, including conducting business. 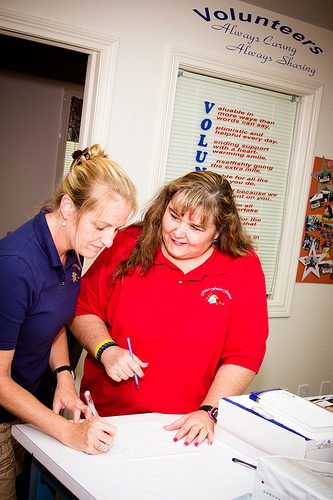 Signing contracts and other documents 20+ years ago involved mailing the items, or a trip to wherever to sign them in person, but now we can just fax or email the documents, and print, sign, scan, and return them just as quickly. However, even that process is still a bit clumsy. Did you know there was a better way? 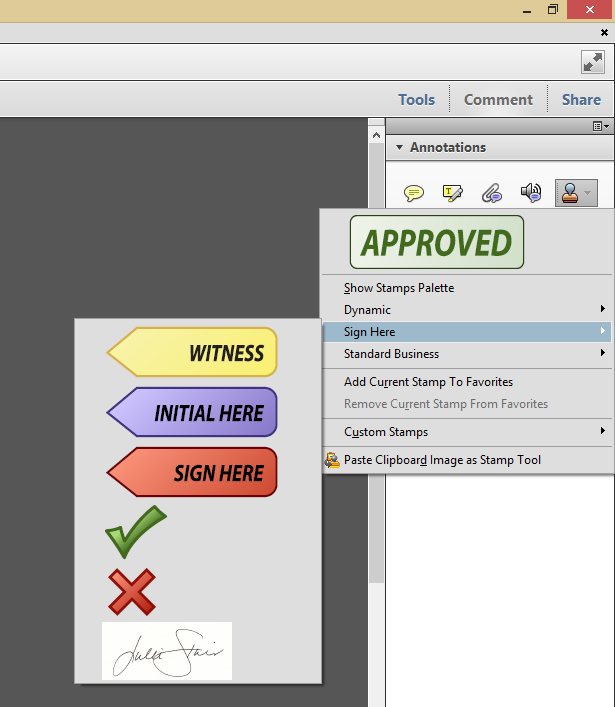 Setup your signature as a stamp in Adobe, and forget about printing and rescanning your document. Instead, sign them digitally, and save yourself some hassle. In order to use the stamp function, you must have the full version of Adobe Acrobat installed on your computer. One way to quickly tell is to look for the word PRO in the title. If you see it, you have the full version. Grab the paper and pen, and sign the paper. Practice your signature in a few different places so that you can use the one that looks the best. Make sure to space out your signatures, so that you have enough “white space” to adequately crop it later. If you initial a lot of documents, make a stamp out of your initials using the same procedure outlined above. You can even write the two on the same paper. When done, scan the paper. Then, open the scanned copy in your favorite photo editing software. (I like Photoshop, but you could use any software that can crop photos.) Crop your favorite signature, and save it as a .JPG file. Do the same thing for your initials, if needed. Acrobat. On the bar across the top, at the far right are the words “Tools,” “Comments,” and “Share.” Click on Comments, go to Add a Stamp > Custom Stamps, and click on Manage Stamps. The Select Image for Custom Stamp window will appear. Click on the Browse button, and locate the JPG file of your signature. Once selected, a preview of your image will appear. If it is the image you want to use, click OK, otherwise, click Browse and locate a better image. Click OK when done. 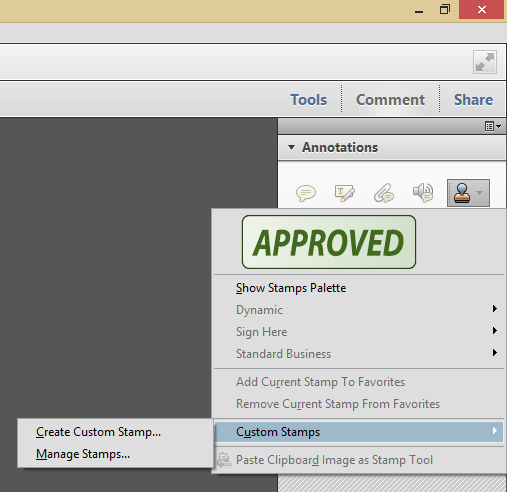 Then, the Create Custom Stamp window appears. From the Category drop down, select “Sign Here.” Give your stamp a nickname by typing a name into the Name Field. By default, “down sample stamp to reduce file size” is checked, leave it check and click OK. Repeat the process for any additional stamps you need to create. To use your stamp, open a PDF. Go to Comment, in the top right, and click on the drop down next to the stamp tool. On the menu, go to Sign Here, and your recently created signature will appear at the bottom. Click on your signature, then click on signature line of the PDF. Your signature will appear. Resize as necessary to fit the document. Important Tip! : It’s not enough to save your document after it’s signed. You flatten the image prior to saving, so that the recipient cannot change the document, or move or copy your signature. To flatten the document prior to saving, go to Layers (located on the right, under the paperclip). If Layers is not shown, go to View (at the top), Show / Hide, Navigation Pane, Layers. Then, click Layers on the right to access the menu. From the Layers menu, select Flatten Image, then save your document. Now it’s ready to send to whomever you’d like. The problem with social media is that it’s designed to trip all of our social conditioning to hook us, getting us addicted. And it’s not entirely social media’s fault – as humans we’re hardwired to be social, it’s inherent to our genetic makeup. However, now that we have access to social outlets almost 24/7, we’re finding it hard to give up, no matter where we’re at, including at the office. 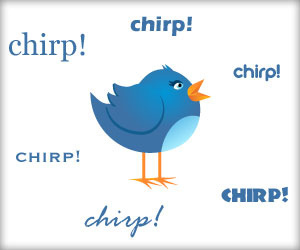 All this socializing is affecting business, to the tune of $650 billion dollars each year. So what can you do to take back control, helping to funnel that wasted energy into something productive for the company? Well you have a few options. When faced with loss of revenue due to low productivity, many companies opt to simply block social media all together. Others choose to install monitoring software to view employees web surfing habits, allowing them to counsel and/or terminate employees as needed. However, there are a few big problems with either scenario. First, blocking social media actually has a detrimental effect in the office. People need to be social, we’re wired that way, and cutting off this ability to socialize can be akin to cutting off an arm to some people. Additionally, blocks and monitoring software can be easily circumvented these days because of smart phones. Knowing their being watched, employees will find other ways to access their social media, including playing on their phone which isn’t on the corporate network. However, studies are finding there’s a much better way to handle this drive to be social – by harnessing it in a corporate setting. Instead of blocking the sites we crave, many companies are simply converting this behavior into something more appropriate, by providing in-house social media outlets. Studies find that companies with an in-house, private social network not only increase morale, but productivity as well. Employees that socialize have better interactions and work together more effectively. Additionally, an in-house social network has been known to foster a sense of corporate community, a win-win for any company. So the next time you’re concerned about your employees spending too much time online, consider doing something that will help boost morale, productivity, and ultimately your company, rather than squash it. Julie Strier is a freelance writer who likes to help you boost your employee productivity without sacrificing morale. Email: julie@mybusinesswriter.com. Website: www.mybusinesswriter.com.